After reading in another post that the threads on the TD venturi body are the same as those of a glow plug, and it could be possible to make a venturi out of a glow plug, you know I had to try it. I grabbed a mystery plug from my junk box that I had gotten in a box o’ stuff last year. I figured drilling out the center for the airflow and cross-drilling for the spraybar shouldn’t be too hard. Here’s what it looks like fit to the TD I had set aside for my Frankenschmitt-109. The plug is an idle bar short of unknown provenance. Doing a little math indicated that a 5/34” drill bit would give me the bore I wanted for running on a bladder. I could have shaped the inlet and outlet more like a venturi's, but I didn't bother. I grabbed a fine thread NVA from my spares and fit it in the cross drilled hole. The fuel hole actually fits exactly center in the glow plug barrel. Here it is fit in the venturi, and mounted on the engine. I’ll try to make time to get it running tomorrow. We’ll see. Mark, I'm the one who suggested doing that. You can open the venturi further than 5/32". The stock venturi can't go any larger than 5/32" due to the fact that you will break out into the jet holes essentially ruining the stock version. I drill a hole in the side of the flat of the hex for a WD-40 straw. I press it in and only allow it to protrude enough into the center for fuel. I then use a remote needle to feed it. Better than a Kirn Kraft. made for rpm with a given prop for comparison for the bench test? Well, I didn't get to run this today. Personal issues got in the way. Maybe soon. Ken, I'm sure you are right, but I am not really trying to optimize this for future use. This is just a "Hmmm, I wonder how well it works" kind of project. If it runs okay at 0.16" diameter venturi I am satisfied with this. Nut (sorry, I don't know your given name), I do not have a baseline. I thought about doing a series of tests with a stock venturi and the plug venturi, but this is project is just a lark. 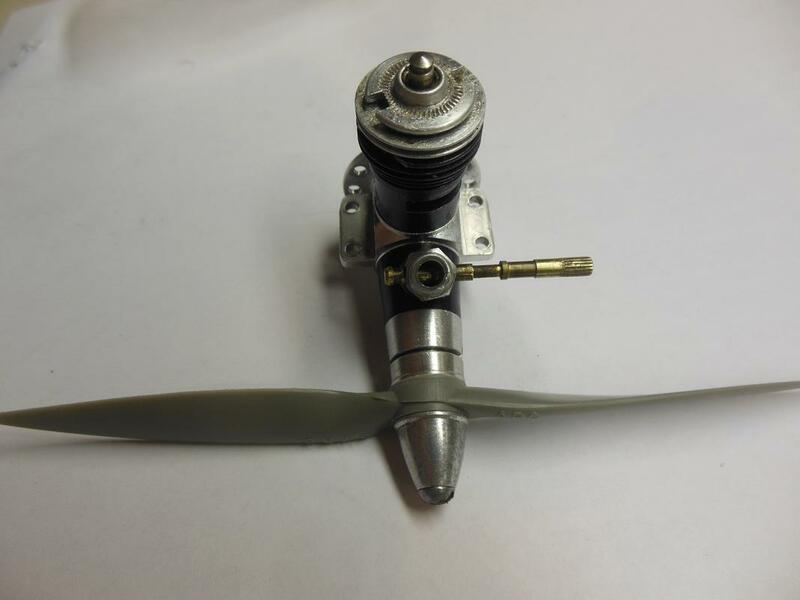 We'll see what I get when I can run this with an APC 5.7x3 prop, which was my favorite TD prop back in the day. Ken Cook wrote: Mark, I'm the one who suggested doing that. You can open the venturi further than 5/32". The stock venturi can't go any larger than 5/32" due to the fact that you will break out into the jet holes essentially ruining the stock version. I drill a hole in the side of the flat of the hex for a WD-40 straw. I press it in and only allow it to protrude enough into the center for fuel. I then use a remote needle to feed it. Better than a Kirn Kraft. Ken do you have a picture of this setup? I can get a picture of my setup. I have done this many times running pressure. A venturi is not needed to run bladder pressure so essentially all you need is a way to just direct fuel into the crank. I recently took my setup apart to utilize it on another plane. It will take me some time to cobble it back together so that I can get a picture that you would understand. It's actually very simple though. Just as Mark has the glow plug/venturi setup I just drill a single hole into the side of the plug and press a small piece of plastic straw into it. 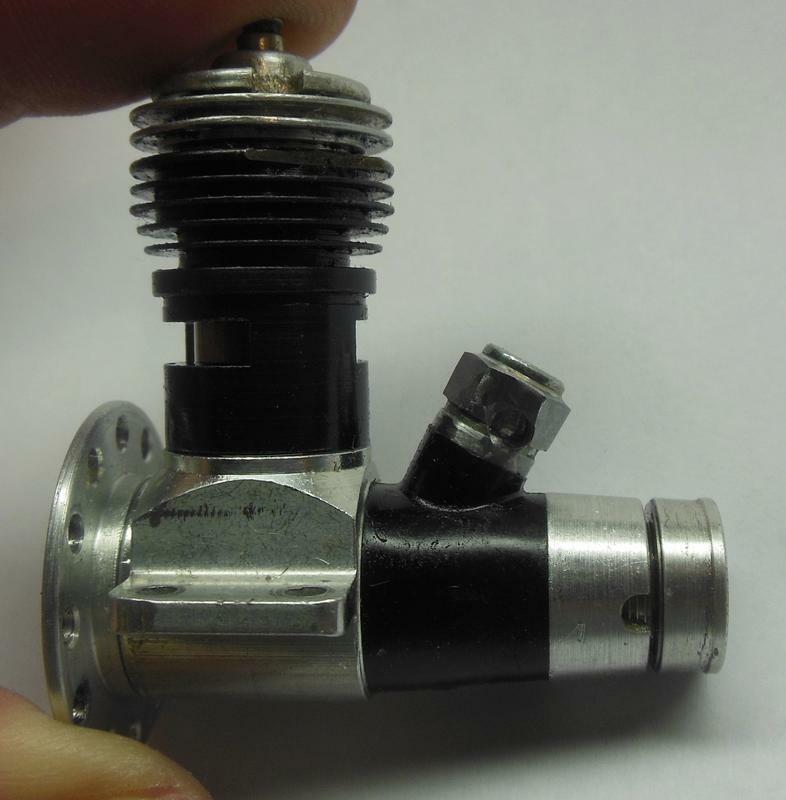 My remote needle valve is just more complicated but it utilizes the fine thread needle valve. Kirn Kraft used to make a venturi very similar to the glow plug venturi setup. Rather than use a spraybar going through the center of the hole stealing choke area, it was a very large through hole. It had a very small diameter piece of copper tubing then soldered into it similar to my WD-40 straw. I like the straw because once I take a heat gun to it, it bends into a hard 90 deg. bend as the heat hits it. Once cooled, it stays put and small pink Prather tubing fits it nicely. I wonder just how much performance is really gained on a Tee Dee by using the circumferential carb system anyway. One of these day when I'm piddlating with my Tee Dees I might do an A-B test with the B part being a Medallion carb system. I have a hunch that it really isn't that much and unless you're in a serious completion scenario, the gain is not worth the problems of fuel passage finickiness and the sanitation measures demanded to keep it running right. 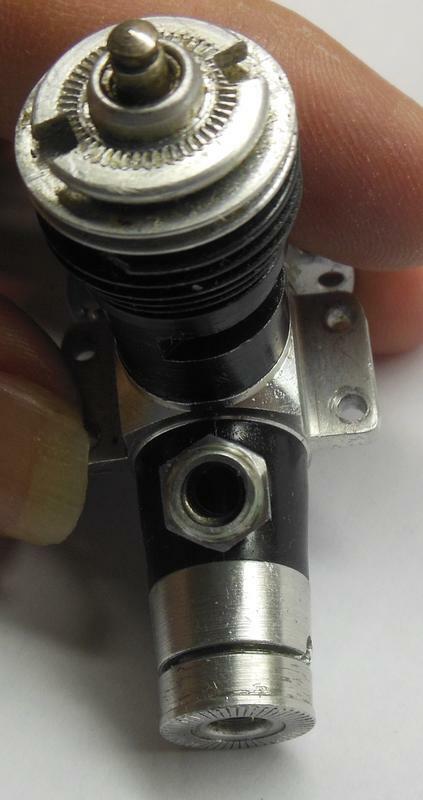 I think that circumferential 3-hole fuel vaporization helps the TD-s reach their brute output...at least I see the difference when I replace the stock carb with an RC carb...if you look into the latter with the engine running you practically see the fuel falling in drops into the carb. Good vaporization of fuel helps faster and more fuel-efficient burning and in my opinion it matters with these small 2-strokers whose efficiency is inherently modest. How do you "time" the glow plug threads with the carb body threads to land the spray bar on and stay at a 90 degree position to crankshaft? I think if one bottoms out the plug in the carb body first then marks the place of the hole for the spraybar 90 degrees relative to the crankshaft, that would suffice. 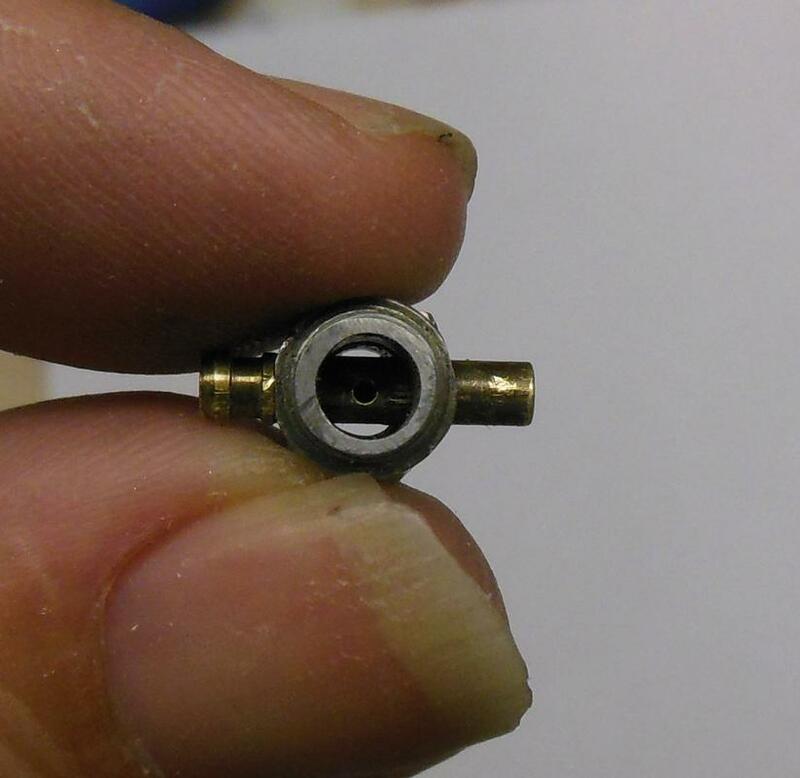 Otherwise a counter-nut put on the plug threads, just like on the COX and Tarno RC carbs, would help positon the spraybar axis perpendicular and keep the plug stay firm. You just tighten it to the next indexed flat. Your barely forcing it and if one is worried about damaging it, use a glow plug washer. Looks good. Another very neat idea I see. I like all there home thought ways to have fun with our 'toys'. All of this is interesting and has appeal to the non-machinist cheapskate hacker in me. If this works out well in the test run there are some fascinating possibilities that include putting crapped out Tee-Dee nylon carb bodies back in service on Tee Dees OR Medallions with the use of some good grade epoxy product and un-waxed dental floss. Also one could opt for an angled away from prop disc spray bar arrangement on a crapped out Tee Tee carb body a la Wen-Mac and make R/H as well as L/H versions to suit that are permanently epoxied. And for those who want drop a little change for a deluxe adjustable and durable setup, do this on an after market metal Tee Dee carb body. Well, I just got back into town Wednesday night after a horrible week away, so I put this on the engine stand yesterday evening. I didn't feel like making up a bladder, so I ran it on suction using a balloon tank. With an APC 5.7x3 prop, Cox high compression head and four gaskets, SIG Champion 35%, and the postage stamp fine NVA open 4 1/2 turns, I was getting 18K on it. A little low, I'd say. It was overcast and humid, but I really don't factor temp/humidity into my tests. Too much work. I'll put the normal Cox venturi on it this afternoon and see what I get for RPM using the same balloon tank. Then I might make up a bladder this evening and see what I get. I might drill it out the next size up on my standard drill index and see what I get if I'm motivated, but right now I'm just kinda worn down and don't feel much like working on any projects. Running bladder to suction or vice versa is not going to yield different rpm numbers. The engine can only make X amount of power, your just delivering the fuel differently. What does allow the engine to make more power is the ability to get more air into it. Seeing you were able to start and run the engine on suction suggests to me that your venturi is small therefore it could be drilled out larger. You don't need any venturi to run bladder, you could unscrew that entire assembly and place a feed pipe directed into the carb body and that would run.